By mid-May of 1942, the forces of Imperial Japan had completed a string of cruel conquests and began a large armored advance along the Burma Road toward Kunming, China. In an effort to confound the enemy, the fleeing Chinese blew up the bridge at the bottom of the tortuous Salween River Gorge. Nothing but a handful of daring pilots of the American Volunteer Group stood in the way of China’s probable demise. 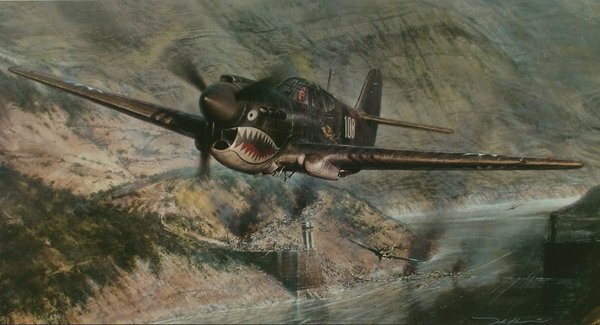 After dive-bombing the winding road above, “Tex” Hill, an ace of the famed Flying Tigers, is shown here leading an attack to cut short the enemy’s attempt to construct a makeshift bridge across the river. As a result of the AVG’s valiant effort, the enemy was forced to retreat, and Kunming would not fall. The painting Tigers in the Gorge was completed in 2002. This was John Shaw’s third in series of AVG scenes, preceded by American Volunteer Group in China (1995), and By the Dawn’s Early Light (1996). A lithograph edition was signed by members of the AVG at a gathering in San Antonio, Texas that year, the home town of the well-loved AVG ace “Tex” Hill.